I have a question that when we are given scores for each skills separately in IELTS, why can’t we take them independent of each skill. I mean if I am getting desired score for three skills, then why have to reappear for all four? Hi Nili, I know what you mean. It is often the case that someone gets the scores they need in 3 skills and they only need a higher mark in the 4th skill, but they have to take the entire test again. 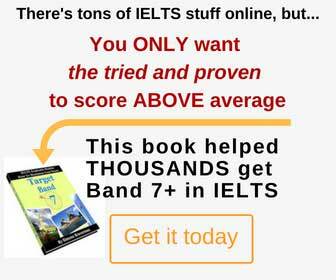 Unfortunately that is how IELTS system works. Only in re-evaluation people can apply to get 1 skill remarked, if they are confident that there’s something wrong with the marking of their test. I Think there a typo? “should be given” is that right? Is it a correct a structure that you have used it here??? Hi Binu, are you asking about the structure of this entire essay or a particular sentence in it? Both versions are acceptable, “be given” is American English and “should be given” is British English, they are both OK to use in IELTS. Why did you say this in the last? Please explain. In terms of lexical resource and grammar there are some minor issues, however, they shouldn’t affect the score much. If you look at the corrections underlined in blue, hold your mouse over them and a better way to say the same thing, or the correct form will be displayed, those are the issues referenced in the teacher’s summary. Okey, you’re saying that both British and American English are acceptable in IELTS, aren’tyou? But, I think, we’ve to use only one of them while we are passing the writing, or the speaking. I still cannot find appropriate answer to this, what do you think ,am I correct? Hi Jasur, yes, it is advisable to use either British or American English spelling, to create an impression of a consistent writer.